Beautiful Rug!! We’ve used it in my daughters bedroom for over a year and it’s held up nicely and stayed clean! Safavieh's Cambridge collection is inspired by timeless designs crafted with the softest wool available. This rug is crafted using a hand-tufted construction with a pile and features main accent color of light pink. Hand-tufted of a 100-percent wool pile, this handmade wool rug features a special high-low construction to add depth and unusual detailing inspired by Moroccan design updated with today's freshest colors. 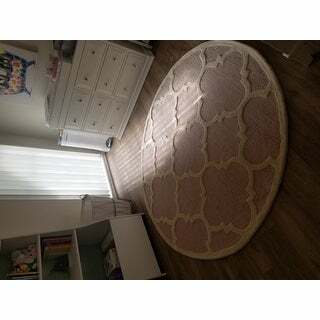 I purchased this rug for my nursery and i love it! Looks exactly like the website advertised. This is my second Safavieh rug, great quality and color are amazing. Highly recommend. This rug is perfect for the middle of my master bedroom. It is nice and heavy but still very easy to clean. The color is just perfect for a neutral bedroom. 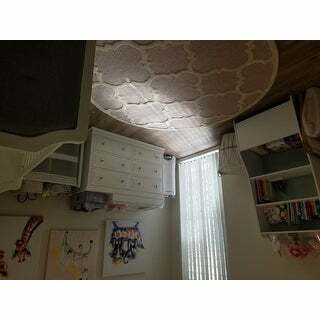 I love the rug, it is beautiful in my daughters nursery, but it sheds all over the place. I did read this in other reviews and I wish I would have chosen a different rug. Just rolled out the rug today and it was not disappointing. Nice thick quality and soft to the touch. Perfect for my daughter's nursery. Love it!! Looks just like photo. I think maybe I should have gotten next size up. Really pretty rug. Great quality. The only thing is that the pink part is kinda rough on the skin, but taking into consideration the fact that we rarely just sit on the rug with no pants on, I’m keeping it! Using in my daughters nursery - its not as pink as the picture but still very soft and cute. Good quality. Sheds when you vacuum it but not so bad that its noticeable. Exactly like it looks on the pic looks perfect in my daughters nursery. It is a little to itchy to put baby on. "What is the circumference of the this rug ? What is the diametr of this rug?"